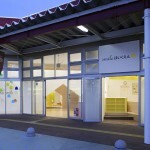 “Mama smile” is an indoor playground facility for families located inside the shopping mall. 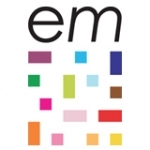 Emmanuelle developed a new brand concept and the interior design, a new family facility has opened in Mito composed of a playground and a day nursery. Although located inside the shopping mall, it gives a sense of security like being in a comfortable home. 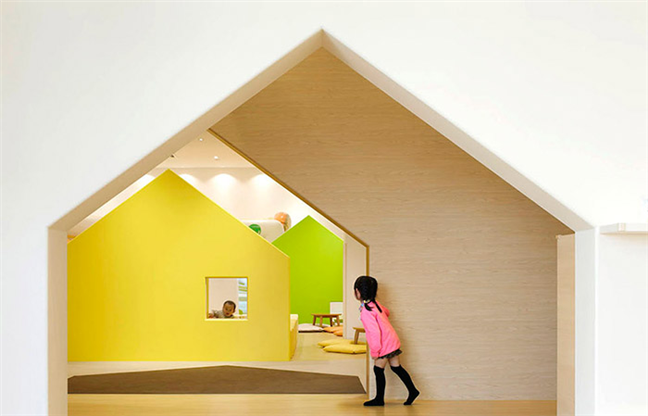 Entrance to the playground has a cut-out opening on a white wall, like a shape of a house drawn by a small child. 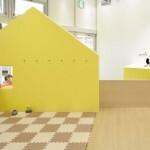 Behind the opening is a colorful world, with houses in 7 colors in the shades of yellow, pink, green, and blue. It is like a miniature town for visitors, with a feeling of being inside a comfortable home. The layout does not give a full view the whole playground, with the colorful houses dividing the space, it encourages curiosities to discover from the gap of the back alleys and between the houses. 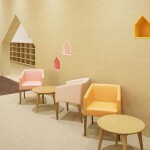 In addition, it is hoped that the colorful space will help with the growth of the mind of the child from the viewpoint of “iro-iku” (iro-iku is a Japanese word, which describes a method of using the effect of color to bring up “concentration”, “imagination” and “communication” of a child). Playground is composed of several areas of different functions. “Area for Everyone (minna-no-hiroba)” is available for various events such as birthday parties, “Area for events (ibento-hiroba)” for game and dance events, the area with air jumper equipments give space for children to run around, and the “Area for Crawling (hai-hai-hiroba)” for babies and the adjacent cafe space with floor cushion is for adults to stay on the same eye level as the children. These areas are gently divided by the houses, letting visitors to spend time while feeling each other’s presence as each area is connected with the whole naturally. “Mama smile” is a place where adults can watch over children playing freely in peace, and it is hoped that the children will build up the rich sensibility in the space full of colors.